We got our hands dirty with the European variant of the Motorola Moto X at its launch event in London. From the outset, it’s very hard to distinguish between the US and Brazil variant and the newly launched European version of the Moto X as Motorola has retained the gorgeous looking design of its flagship smartphone without any alterations. The device also comes with the latest Android operating system – 4.4 KitKat, out of the box. The Motorola Moto X is built around the same 4.7″ AMOLED display of 720p resolution and the magic glass layer protects the device from scratches and minor nicks. Overall, the display offers vibrant colors and is very sensitive. Motorola has designed its own X8 mobile computing system to take care of the performance of its flagship device. The new looking processor is based on the two Krait cores clocked at 1.7 GHz on a Snapdragon S4 Pro chip with Adreno 320 GPU looking after the graphics department. With 2 GB of RAM on-board the device can perform multiple operations without any hassle. On the back is a 10 megapixel rear camera with the Clear Pixel technology that lets up to 75% more light to the sensor to capture great quality images. The shooter also supports different shooting modes such as HDR, panorama and has features like face detection and geo-tagging. You can also use your Moto X to shoot 1080p videos at 30fps with HDR. The secondary 2 megapixel front facing camera is capable of capturing Full HD videos and launching the camera app is as simple as double twisting your wrist. Sadly, the Moto Maker, which is one of the coolest customization options and one of the most popular selling features in the US, will not be available in the European land. 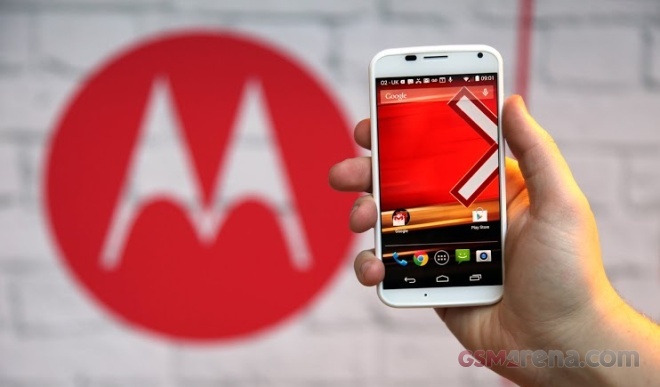 Motorola Moto X SIM-free edition will cost you £380, which is quite expensive considering that the device is available for a much cheaper price tag in the US and with the absence of Moto Maker, we will have to see if the smartphone can enjoy the same success as it did in the United States. For more information, we suggest you to take a look at our detailed Motorola Moto X review, which covers all the details in depth.